One language in one day? It’s possible now! Learn Romanian online with the VocApp courses! 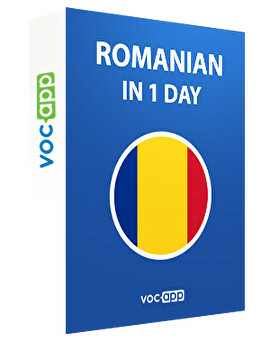 We present you the best way to learn Romanian - with VocApp! Our flashcards are a fun and interesting method to quickly enrich your Romanian vocabulary and remember the new Romanian words forever. This Romanian language course is about the basics of Romanian that can prepare you for your next trip so you can start conversations with natives. In only 1 day, you will get to a brand new level of Romanian! All you need is a bit of effort and you will be rewarded with impressive results. Start learning Romanian words with VocApp right now! What will this Romanian language course bring you? - You will learn the Romanian language basics that you will need in your future trips to Romania and other countries. - You will get introduced to basic Romanian phrases for every situation, learn how to ask for the way, buy a ticket or order at a restaurant. - The Romanian pronunciation will help you learn to speak Romanian! There's no need to doubt your pronunciation skills anymore, we will teach you! - If you had such questions as "How to say good morning in Romanian? ", "How to say hi in Romanian? ", "Which is the word for thank you in Romanian?" and "How to say hello in Romanian? ", we will answer all of them (and not only) in this course! - Thanks to our flashcards, your Romanian vocabulary will grow day by day! The Spaced Repetition System will remind you which Romanian words you need to repeat in order to remember them forever! - The Romanian to English translation and example sentences will guarantee you understand the meaning of the word fully and are able to use it in your own conversations. - You can further polish your basic Romanian knowledge with the free Romanian lessons we offer on our site and the many professional Romanian language courses that our linguists prepared for you! Take a look at our Romanian: day 2 course that will strenghten your knowledge. The Romanian for travelling course is perfect for those who wish to travel to Romania.